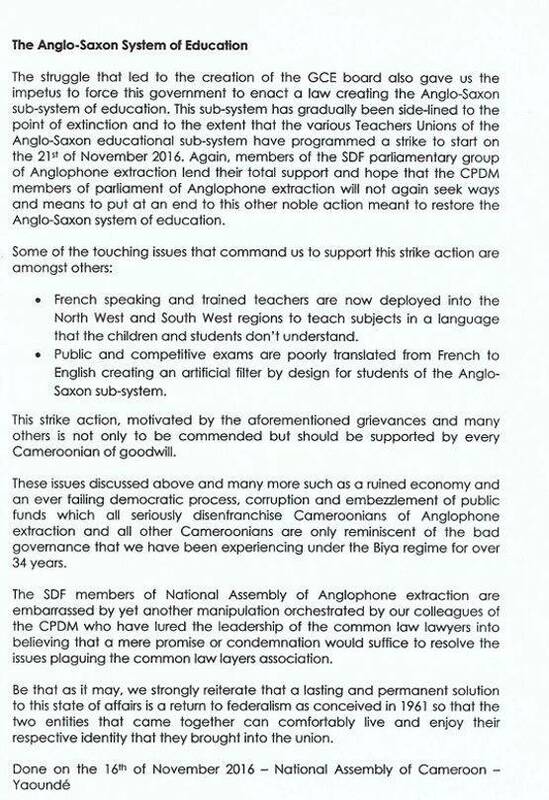 Lawyers, teachers, pupils, university lecturers and students in the Anglophone parts of Cameroon (North West and South West regions) went on indefinite strike today Monday, 21 November 2016, against marginalisation of Anglophones and deliberate attempts by Francophones to destroy anything in Cameroon that is unique to Anglophones, such as the English language, Common Law justice system, education system, Anglophone values etc. For the past one month, Anglophone lawyers had been on strike and they were joined today by the educational sector. 1) The Cameroon government is flooding Anglophone Cameroon with too many Francophones in various sectors that are controlled by government. As a result, very few Anglophones are given jobs and when you have many francophones in those government sectors, the French language is used mostly. 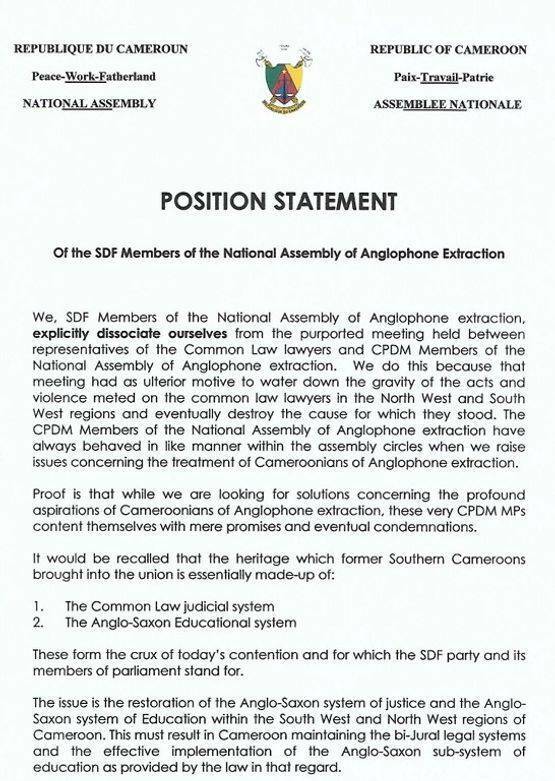 They claim that this is an attempt by Francophones to frustrate Anglophones and dwarf the English language in Anglophone areas. 2) More than 90 per cent of top government jobs in the North West and South West are held by Francophones to the utter dismay of Anglophones. Governors, almost all the SDOs and DOs in the Anglophone regions are Francophones. Anglophones claim that these francophones serve but their own personal interests and the interest of other francophones. There have been allegations of land grabbing in Anglophone regions by these francophone administrators and investigations have been carried out. None of the administrators has been sanctioned. 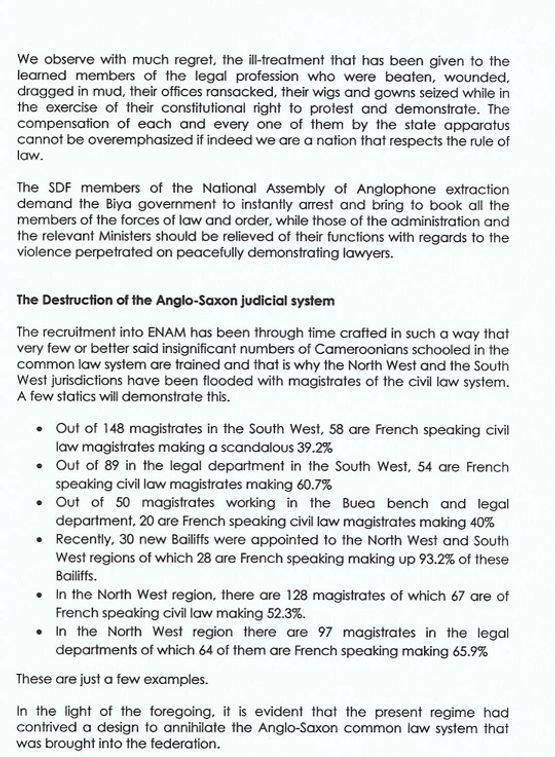 3) Francophones have been bent on destroying the COMMON LAW legal system in Cameroon for many years but Anglophone lawyers have declared that they would fight to whatever heights God can offer to prevent that from happening. 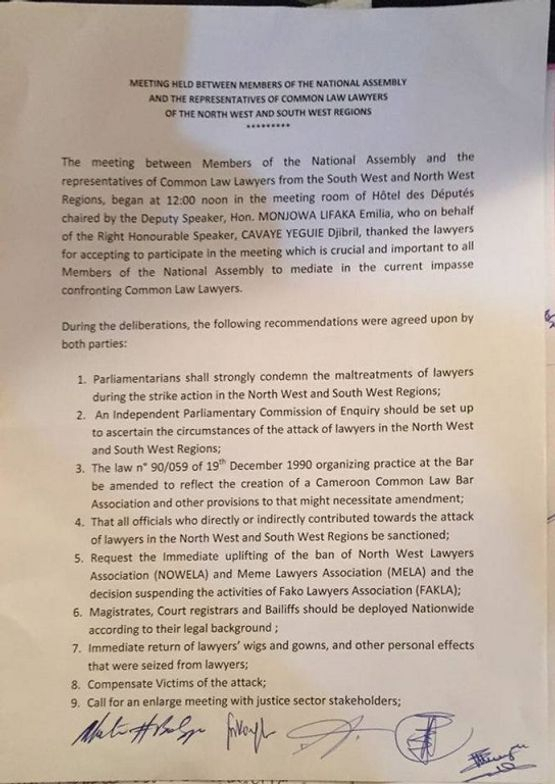 Anglophone lawyers (not politicians) are the backbone of Anglophone survival. 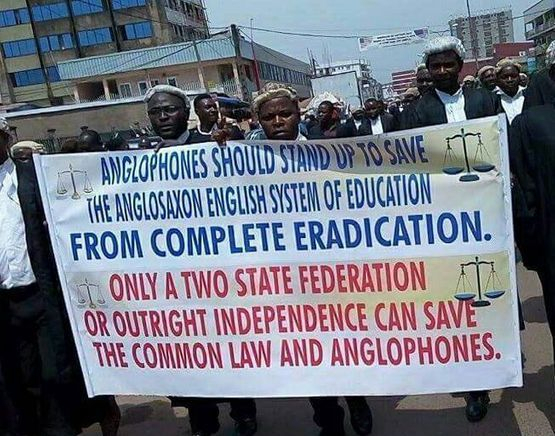 They have been fighting against the decimation of COMMON LAW AND THE ENGLISH language in Anglophone Cameroon. Yaoundé deliberately sends too many francophone magistrates to work in Anglophone courts. These magistrates can't even speak English and provocatively conduct court proceedings in French to English speakers. 4) Education; the Anglophone education system has been under attack from francophones for many years. Francophones have been using back-door ways to get rid of it and now, Anglophone teachers, lecturers and students have stood up to fight for what belongs to them. Francophones have been flooding Higher Teacher Training Colleges in the Anglophone sector that are meant for English speakers. These Francophones can't communicate properly in English and as a result, they transform the institutions from English speaking into French speaking. Buea and Bamenda universities have too many Francophone lecturers and administrators, and many of them speak very poor English grammar. These goes against the main reasons why these anglosaxon universities were created. About 80 per cent of admissions into the university of Buea medical school are Francophones. Does this shock you? You must be shocked if you are an Anglophone. A list of francophone students is imposed on Buea university for admission into the medical school. This happens every year. Yet, Anglophone brain boxes who achieve many 'A' grades at the A-Levels and meet all the criteria don't get admitted into the medical course. Buea university was created for English speakers hence at least 90 per cent of medical admissions should be Anglophones, for goodness sake. 5) Why is it that police officers and gendarmes who work in the North West and South West force Anglophones to speak to them in French when it should be the other way round? Who on earth sends these people to work on Anglophone land when they (officers) can't speak the language of those people. Hence, Anglophones want that all security officers who are posted to work in the North West and South West must be competent in English otherwise should be posted to Francophone regions. 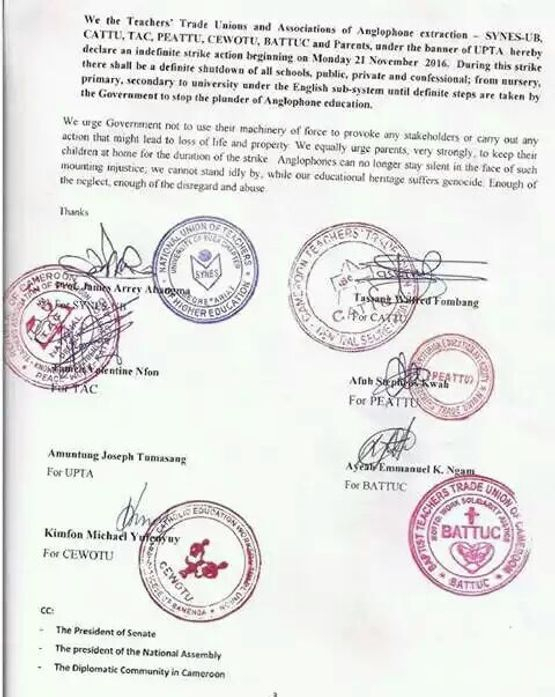 BELOW ARE SOME OF THE PRESS RELEASES FROM VARIOUS ORGANISATIONS AND TRADE UNIONS FROM ANGLOPHONE CAMEROON.